Sorry, I just had to say it. We’ve been waiting to drop some of the plot bombs seen in Episode 7 for quite awhile now. As a writer, I tend to geek out over those things. Nick and Daniel always tease me that I would end every episode “Lost” style with the resounding thud coupled with the TLW logo. It’s true. There would also be yetis with gatling guns. Damn Source engine and its limitations. While today is April Fool’s, we don’t have any plans lined up. We thought about it a couple of times, but time working on these fake projects would detract from our break, which is going awesomely at the moment. 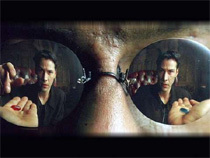 Interestingly enough, yesterday marked the 10th anniversary of the Matrix. Kind of odd to think about. Doesn’t feel like 10 years at all. That’s one of those movies that I could watch over and over, without really caring. There’s a few of those on my list. Serenity, The Last Crusade, Fellowship of the Ring, Apollo 13, etc. What about you guys? What movie can you watch again and again? This entry was posted in film, News, TheLeetWorld and tagged apollo 13, fellowship of the ring, indiana jones and the last crusade, leet world, lost, matrix, movies, source engine on April 1, 2009 by Eddy.